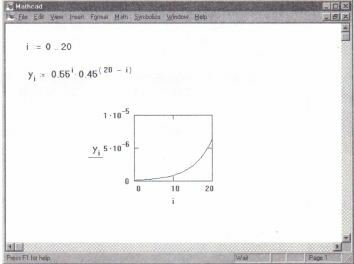 Each trace on a graph depends on a range variable, and Mathcad graphs one point for each value in the range variable. As mentioned in the previous section, however, Mathcad automatically generates a default range for the dependent variable of an expression you type in the y-axis and creates the graph over it if you do not explicitly define a range variable. If you want to specify exactly what range of values the range variable has, you can define a range variable in your worksheet. 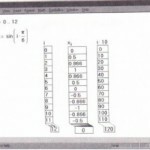 This method is described in the following sections. • Define a range variable, such as x, that ranges over the values you want to graph. (The range variable need not be called x; you can use any valid Mathcad name.) for instructions on defining a range variable. • Type the expression you want to plot in the middle placeholder of the y-axis andtype x in the middle placeholder of the x-axis. • Click anywhere outside the graph region to see the plot. 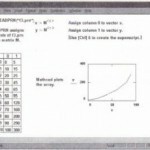 Graphing an expression against a range variable. 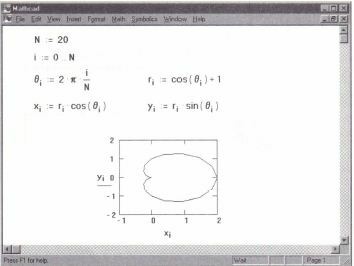 By creatively using the tools presented in this chapter, you can plot a wide variety of closed curves. The example in Figure 20-3 illustrates how to transform polar into rectangular coordinates. This technique lets you create polar plots, or even paths in the complex plane. 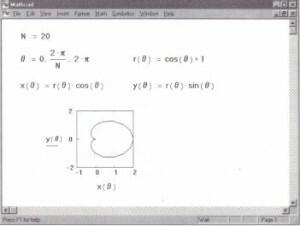 In Figure 20-3, the equation for the cardioid in polar coordinates is given by r(8). The equations for x(8) and y(8) are the usual transformation from polar to rectangular coordinates. 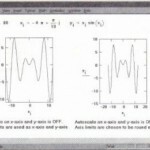 See , “Polar Plots,” for a description of Mathcad’s built-in polar plotting capabilities. • Define a range variable i that references the subscript of each element you want to plot. •Define a vector Yi’ Use the left bracket key, [, to create the subscript. • Press @ to create an empty plot region. • Place Yi in the middle placeholder of the vertical axis and i in the middle placeholder of the horizontal axis. 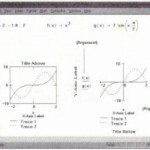 A graph created using these steps is shown in Figure 20-4. Subscripts must be non-negative integers (or integers greater than or equal to ORIGIN, if ORIGIN:;cO.) This means that the x-axis variable used in a graph like Figure 20-4 can run through whole-number values only. If you want to graph fractional or negative values on the x-axis, graph a function as in Figure 20-2, or graph two vectors as described in the next section. If you have a handful of data points that don’t have a convenient functional relationship as in Figure 20-4 but there are too few of them for you to use data files, you might want to use an input table to create a vector. For more information, see “Entering data manually” on page 429. 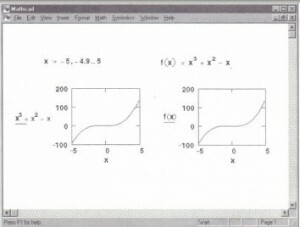 • Define x and Y as shown in the figure. • Press @ to create an empty graph region. • Place y in the middle placeholder of the y-axis and x in the middle placeholder of the x-axis. 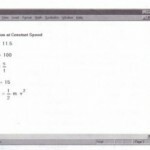 Mathcad plots all the elements in the vector x against the elements in the vector y. If the vectors are not the same length, Mathcad will plot the number of elements in the shorter vector. • The two vector must share the same subscript. For example, you cannot plot xi against Yj because i andj are not the same subscript. • Place vYt in the middle placeholder of the y-axis and vXt in the middle placeholder of the x-axis. Although the x vector in Figure 20-5 is a list of evenly spaced values, this need not be the case. Only the i values are required to be evenly spaced integers. No such restriction exists for the Xi . 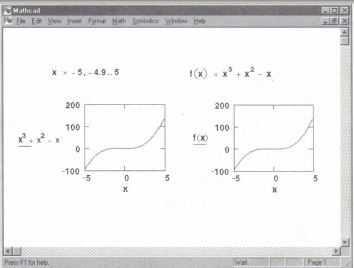 his allows you to plot something besides integers on the x-axis while still satisfying the requirement for integers as subscripts. 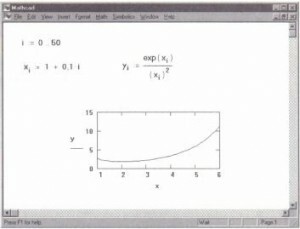 In Figure 20-5, the Yi came directly from the xi’ Other applications might compute x and Y independently from a third variable. As long as the two vectors use the same range variable, you can graph them on the same graph. Figure 20-6 shows a polar graph in which both x and y depend on the variables rand 9. 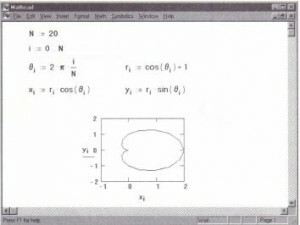 Figure 20-6 uses vectors to do what was done with functions in Figure 20-3.